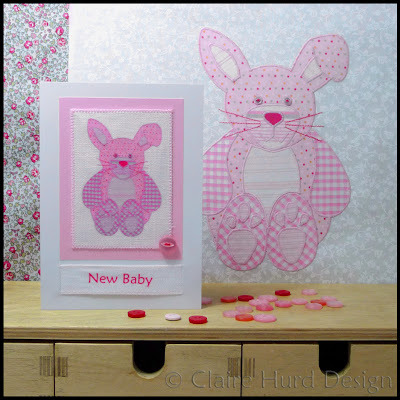 New Baby Cards - Baby Blue Bear and Baby Pink Bunny! I have finally listed some 'New Baby' cards in my Folksy shop based on the Baby Blue Bear and Baby Pink Bunny applique characters I made recently. 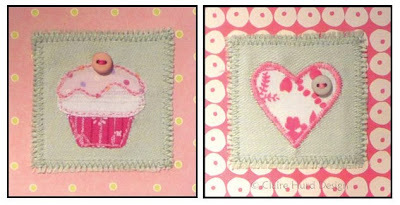 I have made these cards by creating a textile transfer of my original appliqued characters. I have then applied the transfers to a fine white linen fabric and stitched it, along with a co-ordinating paper border, to the white card base. I have hand-stitched on a button as a finishing touch. 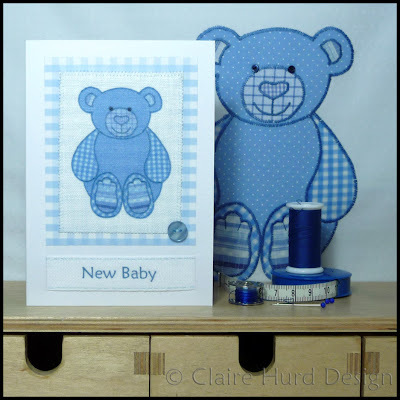 The 'New Baby' message is also a textile transfer and has been applied to a cotton tape with a hand-stitched border. The tape has been threaded through the card and secured neatly on the reverse. 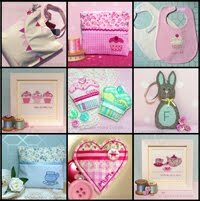 I am still working on a personalised version for my NOTHS shop. So far I have come up with this design but am still not sure about it. 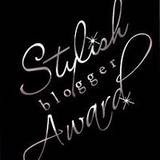 It would be great to have some feedback from my lovely blog followers to let me know what you think. I am not happy with the hand-written text, I feel it does not look professional enough. I am tempted to replace the congratulations banner (perhaps put it inside the card) with a personalised printed ribbon. 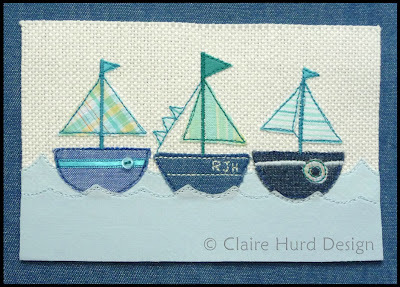 As a follow on from my handmade boating greetings card shown in my last post I have designed an embroidered and appliqued boating artwork. This artwork will be framed in a similar style to my 'Cupcake' and 'Afternoon Tea' artworks and can be personalised by changing the initials on the middle boat to any three letters/numbers of your choice. I am currently sourcing new frames for my textile artworks - I have found some great high quality wooden frames made in the UK so now just need to approve samples and place my order. This design will be available in my NOTHS shop in the next couple of weeks once I have frames available. 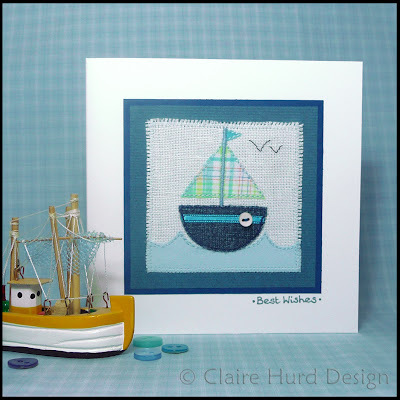 If you wish to pre-order a 'Boating' artwork then please email me with your requirements at studio@clairehurd.co.uk. 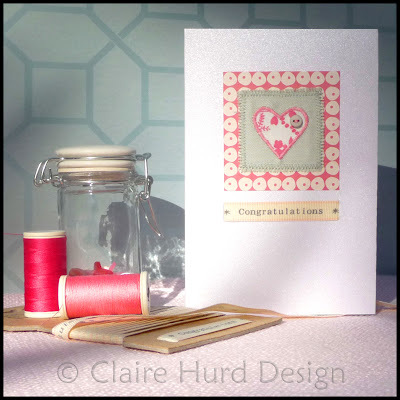 Having focused on rather girly cards recently I thought I ought to add a more masculine design in to the mix. With my love of the seaside and taking inspiration from my many photographs taken on a recent trip to St. Ives, Cornwall, the natural choice of motif for me was a boat. The denim and cotton boat has been appliqued on to a textured cotton base and embellished with fine satin ribbon and a miniature button. The birds have been embroidered by hand and the text is hand-written. I shall be adding this card to my online shops (NOTHS and Folksy) and as I will be making it to order shall be offering to change the text and personalise the card for free. If you would like to commission something similar, perhaps in a different colour, then please email me directly at studio@clairehurd.co.uk. 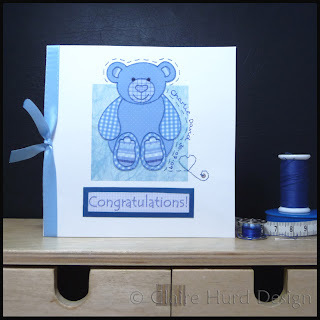 Remember a while back when I wrote this post about my Christening card design? 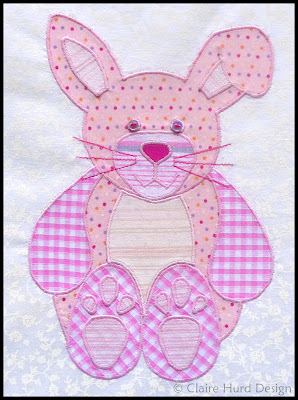 Well, I have finally managed to photograph the pink bunny motif that I have created to act as the girl's version of the baby blue bear shown before. 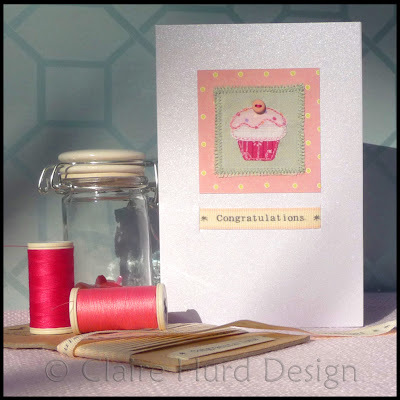 The two motifs are intended for use on personalised cards to celebrate Christenings and also for 'New Baby' congratulations cards. I shall add a new post soon showing the final card designs. 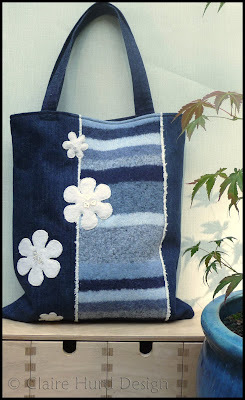 This is the latest handmade tote bag I have made for myself. I have made use of a cosy woollen scarf that I accidentally felted slightly in the wash (woops - a wool wash setting is not always gentle enough!). The flowers are a really lovely cream wool that I only have the tiniest amount of. 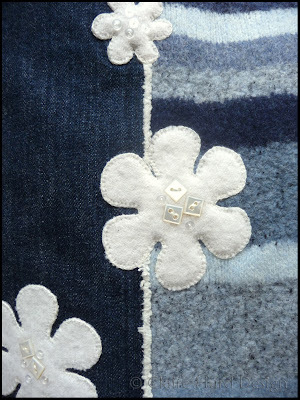 The centre detail is a jumble of differently sized and shaped cream buttons. The main body is a sturdy denim fabric and I have used the selvedge edge as a feature. 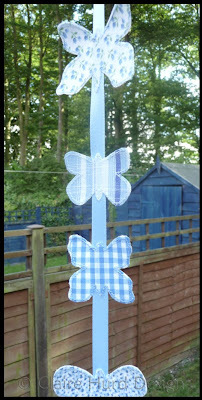 This butterfly garland is a new product that I am considering adding to my NOTHS shop. It is difficult to take a good photo of it where I have it hanging at home but it lives at the end of the curtain rail by the patio doors. I am hoping to create a small range using different fabric motifs. This product is a great way to use up fabric scraps that are too small to be used on other items. This one was a little fiddly to make but once I have created templates and have produced a few garlands I am sure I will get up to speed. I thought I would share my latest baby blanket commissions with you today. I am really pleased with how they have turned out. 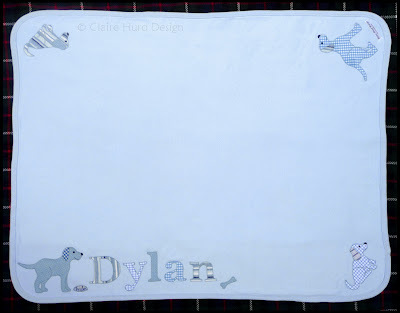 I am particularly pleased with Dylan's blanket which was a special commission with extra motifs. If you look carefully I have even included the name of the family dog on the dog bowl! As all other designers will know, you have to get ready for Christmas very early in this business. 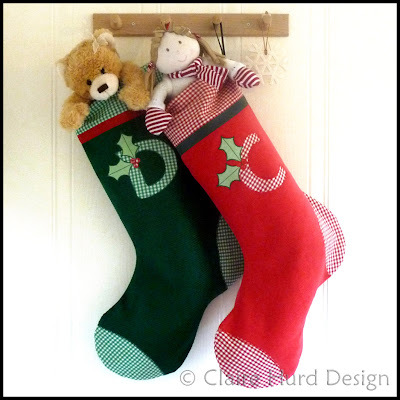 I have therefore been working on new personalised Christmas stockings for 2009. I have perfected my stocking shape which I first experimented with in 2006 when I made the grey stocking in this image. This year's design is simple yet striking making it easy for me to produce at short notice for custom orders. I have chosen nice bright Christmas colours and cheerful gingham fabrics. The stockings themselves are made from corduroy making them cosy and robust. I have added a hanging loop to the top and secured it in such a way that it is hidden from view if not in use. I shall be adding these stockings to my NOTHS shop later on in the year. However, if you are super organised and would like to order one before then or would like something custom made in a similar style then do not hesitiate to contact me. Simply send me an email with your request to studio@clairehurd.co.uk. Just One Baby Blanket Left! 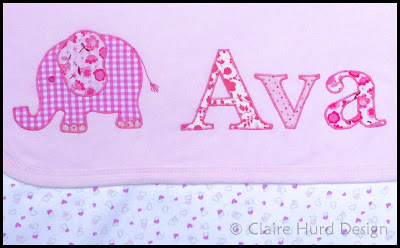 I have just one baby blanket for personalisation left (in pink). I am offering it at my promotional price of £15.oo until the end of the day on a first-come-first-served basis. 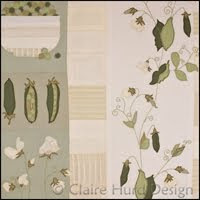 Simply email me your requirements at studio@clairehurd.co.uk. These blankets have proved so popular with almost every person who has received one as a gift then ordering another for a friend! In light of this, as soon as I am able to get hold of more blankets, I shall be listing them on my Folksy Shop. I shall let you know as soon as they are available. 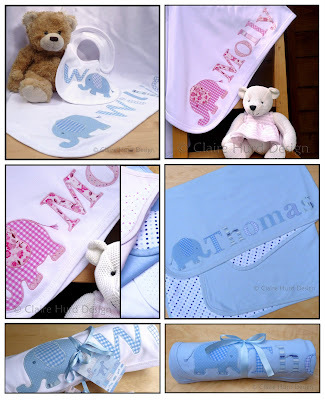 Last Day of Baby Blanket Special Offer! 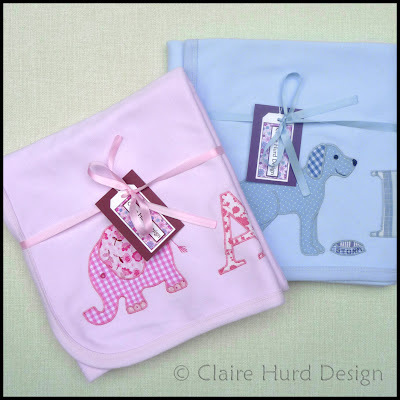 My special offer of £15.00 and free P&P on personalised baby blankets ends at midnight tonight. If you want to take advantage of the offer then simply email me at studio@clairehurd.co.uk with your requirements. Today I have been making use of the 'Congratulations' ribbon that I rediscovered. 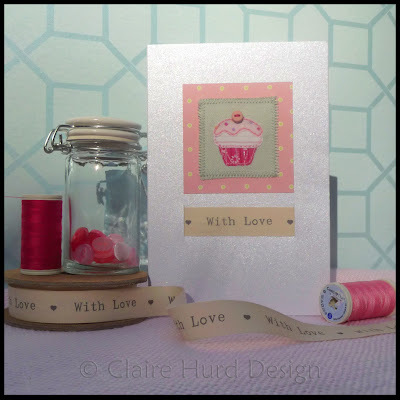 I have been adding to my greetings card collection that began with my 'With Love' card. I am really pleased with this collection. I love the colours and enjoy producing the delicate little motifs. These cards are all for sale in my Folksy store, do pop along and take a look. I picked up the new Marks and Spencer Autumn/Winter Home catalogue yesterday and as is my habit turned straight to the children's bedlinen. I was really happy to find that on page 205 one of my designs is featured in the new collection. 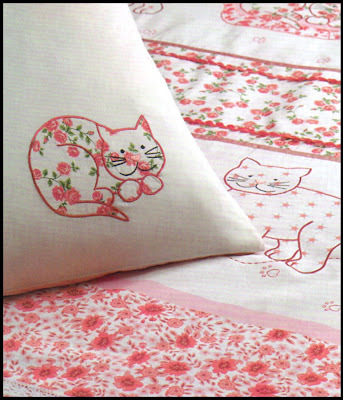 The design is called 'Patch Kitten' and is based on an artwork I sold to Marks and Spencer last year. Once again they have done a lovely job of remaining faithful to my original artwork. 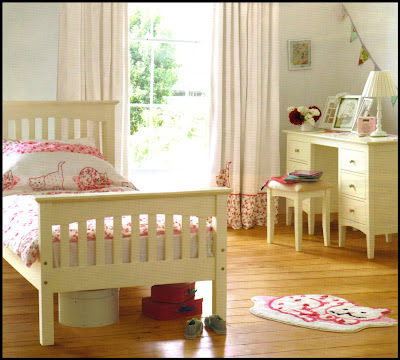 The range includes a single bed linen set, a double bed linen set, curtains and a rug. I am really pleased with how the design has turned out and now can't wait to see it in the flesh.